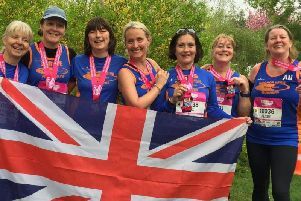 Bognor Rugby Club is inviting women to grab a friend and take on a new challenge. The club are offering women a way of broadening their horizons as they encourage them to step out of their comfort zone with a fun introduction to rugby. A ‘warrior camp’ session is planned this Sunday (January 20) from 10.30am to midday, at Bognor RFC, Hampshire Avenue. Rugby attracts people from all walks of life and is an incredibly inclusive sport – which has contributed to it being one of the fastest growing female team sports in England. The warrior camp consists of paired activities used to teach participants the skills and techniques of rugby. The activities require players to work together to learn, have fun and succeed. Vicky Macqueen, former England international, said: “Rugby is a very sociable sport. The work you do together on the pitch bonds you on and off the pitch, and rugby has given me so many lifelong friends. England Rugby’s inner warrior campaign aims to attract more women to take up contact rugby. The camps teach participants key introductory skills and drills for rugby, with help on hand at every step. All you’ll need to take part are a pair of trainers, your usual workout gear and a ‘have a go’ attitude.